If you would like more information upon our range of Writing Tables contact The Dorking Desk Shop. 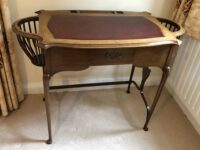 Fine quality Victorian faded mahogany writing table. Pretty French walnut side table with brass mounts, mouldings and ring handles. Fine quality Victorian oak partners writing table by Waring & Sons London. Fine quality, George 111 style, mahogany library writing table.